I love this time of the year and I especially enjoy those cool & refreshing beverages that quench a thirst on a hot summer day. The following recipe, photo and information is courtesy of the U.S. Apple Association. Looks delicious! 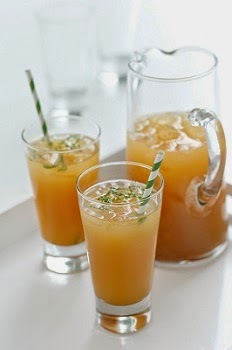 Just in time for another hot summer, U.S. Apple Association (USApple)  which represents apple growers and producers nationwide  has mixed up Apple Ginger Chillers, a simple and refreshing mock-tail that tingles the taste buds with a delicious trio of apple cider, ginger beer and vanilla bean syrup ingredients. Directions: Bring simple syrup ingredients to a boil, strain and chill. Pour all ingredients together over ice and garnish with fresh mint leaf. Enjoy!